Starting from the end of season 1, Eriko Osawa's (Yuki Amami) cellphone rings at Narita International Airport as she about to leave the country. She will then return to the special detective unit to take on a case that will shake the entire country. orz Aug 02 2016 12:29 am I really hope there is a season 3. I'm so addicted. For now, I'm just going to replace season 1 and 2.
joy Jul 28 2015 7:02 am can`t help myself but to watch again...[boss season 1 and 2, I did miss them, waiting for season3 yay! ester grace Feb 07 2015 9:37 am One of a kind hilarious! Amami Yuki really caught my attention, very good actress! And all the other actors have done a excelent job as well. If you are looking for something different detective drama, maybe you should try this. aoi Jan 27 2015 12:36 pm I just finished the whole series, and I'm still hooked on it! I gotta admit I want another season too, but I guess they'll have to come up with more complicated crimes and more amusing ways on how they corner the criminals. Osawa Eriko's "acting" like it was over then finally revealing it was just an act to catch the criminal is amazing and all (thanks to Amami Yuki's awesomeness), but it would just start to look like too much anticipating if it was used repetitively. Mic Dec 02 2013 10:05 am Wow! 2PM was there! Great surprise! Mic Dec 01 2013 4:13 pm I like this series. Like the casts and like the story. But come on, the writers ran out of plots? Kimoto got kidnapped again?! Morse Codes again?! 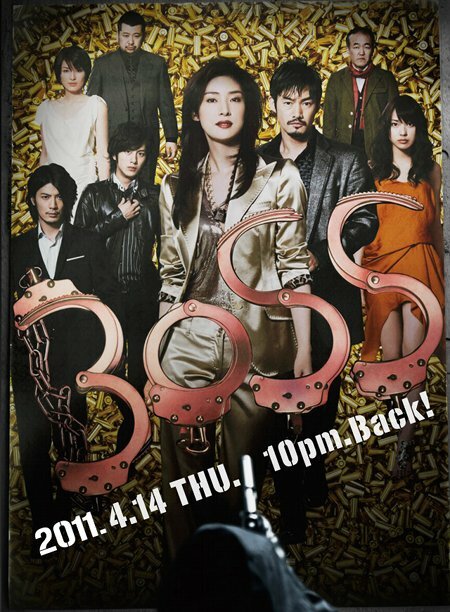 mon Nov 25 2013 8:17 am good day, i am from the philippines and i used to watch BOSS season 1 on RED channel, cable television. Now they are showing season 2. I like watching it and the actors and actresses are very good and funny. The contents of the different episodes are always interesting. i watch it in japanese with english subtitles. acufene Apr 02 2013 7:43 am Write more, thats all I have to say. Literally, it seems as though you relied on the video to make your point. You obviously know what youre talking about, why waste your intelligence on just posting videos to your blog when you could be giving us something enlightening to read? Sue Mar 13 2013 4:01 am I really love this show!!! will they have season 3?? I really hope they can continues!! i really love it!!! Matilhda May 08 2012 6:32 pm I love this drama soo much did a marathon watching seasons 1 & 2, I love the entire cast and have my fingers crossed there will be a season 3.
misso Apr 21 2011 7:26 pm watched the first ep on viki subbed!! yessshhh i like it so far.. but is erika toda just guesting and not part of the main cast?? now?? because she's definitely one of favorite characters.. its a shame to write her off the plot..
Huiting Mar 13 2011 12:31 am This is gonna be epic. NINA Feb 14 2011 6:05 am CANT WAIT! !